France will do all it can to keep Greece in the eurozone, because allowing it to leave would be too risky, PM Manuel Valls has said. "The basis for a deal exists," he said, ahead of an emergency eurozone summit. However, Germany has warned against any unconditional debt write-off. The eurozone had urged Greece to submit fresh proposals after its people rejected the latest draft bailout in a referendum. However, sources say no new written plan was presented on Tuesday. Greek Prime Minister Alexis Tsipras's has been said to want Greece's vast €323bn ($356bn; £228bn) debt to be cut by up to 30%, with a 20-year grace period. 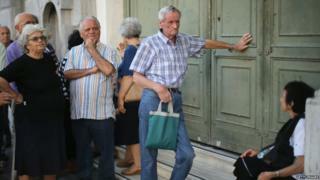 Greece's teetering banks are to stay closed on Tuesday and Wednesday. A picture of Angela Merkel wearing an old Prussian military helmet dominates the front cover of Bild. "Today," the headline reads "we need the Iron Chancellor!" referring to Otto von Bismarck, who first held the post. For weeks the tabloid has been leading the charge against Greece. Like many here, it has had enough. "No more billions for Greece," it urged on Tuesday. The chancellor is under huge domestic pressure not to cave in to Greek demands for debt relief. Her deputy, Sigmar Gabriel, has said that to do so would destroy the eurozone. And on Tuesday the CSU (her party's Bavarian ally) went further: general secretary Andreas Schueur wants Berlin to reject further negotiations, let alone a third bailout package. The Bavarian finance minister, Markus Soeder, has said he simply wants Greece out of the eurozone. And these are the MPs who will have to vote before negotiations over any proposed new deal can even start. Mrs Merkel says she wants to keep the eurozone together; she's got a battle on her hands at home first. Where do eurozone countries stand? European finance ministers and officials gathered in Brussels told reporters they wanted to hear new proposals from Greece's new finance minister, Euclid Tsakalotos, ahead of a full summit of eurozone leaders later. Eurogroup chairman Jeroen Dijsselbloem said as he arrived: "The pressure is especially on the Greeks, the banks are closed and the situation is difficult. I guess the Greek government has an interest in coming up with serious and credible solutions soon." One told Reuters: "They say they will submit a new request and outline of proposals, maybe tomorrow (Wednesday)." A Greek government official told the news agency that Mr Tsipras would address the European Parliament on Wednesday. Peter Kazimir, finance minister of Slovakia - one of the countries with the highest exposure to Greek debt - said he was "sceptical" that a deal would be found, adding that debt relief was a "red line for my country". What are the scenarios for Greece? In his comments on Tuesday, Mr Valls said the eurozone could not "take the risk of Greece leaving" - for economic as well as political reasons. "There is no taboo subject when it comes to [Greek] debt," he told French radio. Germany, which takes a tougher line, has warned against any unconditional write-off of Greece's debt, amid fears it would destroy the single currency. German economy minister and vice chancellor Sigmar Gabriel said: "The other 18 member states of the euro can't just go along with an unconditional haircut [debt write-off]." Several eurozone countries - including Malta, Slovakia and Estonia - are owed significantly more by Greece as a percentage of GDP than Germany or France. But the two most important leaders in the eurozone, Angela Merkel and Francois Hollande, appear to be struggling to find a common position on Greece in the wake of Sunday's "No" vote. Broadly speaking, some countries - led by France - are pushing for a deal that will give Greece some breathing space to stay in the eurozone. Others - led by Germany - are under greater political pressure at home, and wonder whether such a deal is possible. Meanwhile, the ECB said it would keep emergency cash support for Greek banks, which are running out of funds and on the verge of collapse, at the same frozen level - refusing requests for additional support. It told the banks to lodge more collateral - or assets - with the Bank of Greece, reducing the amount of spare cash the banks have. Capital controls have been imposed, with people unable to withdraw more than €60 a day from cash machines. On Tuesday, Western Union said it was reactivating its Direct to Bank service to Greece, allowing funds to be transferred into bank accounts there from 31 countries. The European Commission - one of the "troika" of creditors along with the IMF and the ECB - wants Athens to raise taxes and slash welfare spending to meet its debt obligations. Greece's Syriza-led left-wing government, which was elected in January on an anti-austerity platform, said creditors had tried to use fear to put pressure on Greeks.